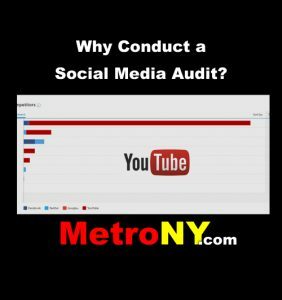 Why Conduct a Social Media Audit? Have you taken the time to evaluate your brand’s social media efforts? Do you ever peak at what your competitors are posting? It may be time to take evaluate your social media strategy and change your plan based on what you see. The goal of an audit is to identify the social media content that resonates with your audience, determine which channels are effective, and learn how to adjust strategy when you are not getting the results you want. Small businesses tend not to view themselves as competitors to larger entities. Don’t be reluctant to name five or six businesses you’d like to emulate. View this this as a learning exercise. Use their big budget strategies to find out what works. Even if you feel you are just a mosquito in your sector, know that you could learn a lot from someone else’s strategy. An audit involves taking a long look technical look at your daily activity on all of your social channels. It should also involve looking at unowned social channels. Unowned social accounts are those where users talk about your brand. While you may or may not be able to respond to the posts, you should at least be aware of them. Examples of unowned accounts include sites such as Tripadvisor.com and Yelp.com. Who has all the passwords? Who really owns the accounts? Is content unique per channel or re-purposed? Are followers engaged or irritated? What is the optimum time and frequency to post on a per channel basis? An audit will reveal if there is an opening for your brand to take advantage of. It is possible your competitors are not using a channel to its full potential. They may be losing followers and valuable web traffic by posting the wrong content or even over-posting. Learn about how your social media is working (or not!) for your brand. Measuring the return-on-investment is a challenge with any social media campaign. The only way to find out of your strategy is paying off is to periodically evaluate what works and what does not and see how it fits with your overall marketing strategy.